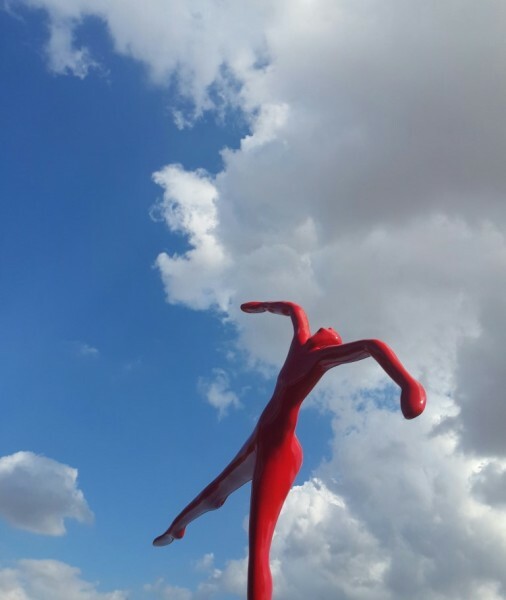 Sculpture, made of colour aluminum, titled “Dancer on air” by Kostis Georgiou. The renowned Greek painter & sculptor Kostis Georgiou has shown his works all over the world since 1974. His artworks were acknowledged for their significance and uniqueness worldwide. He has shown his works at some of the major museums, his monumental sculptures adorn public spaces all over the world, while his smaller sculptures, installations and paintings are found in private collections and Museum collections internationally. Strongly put, Kostis Georgiou is considered one of the most important living Greek visual artists now.